May 3 & 4, 2019 @ 7:30 p.m.
Purchase tickets online, or call 309-693-6725. 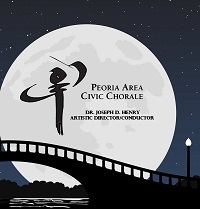 Join the Peoria Area Civic Chorale for a family-friendly performance of “a little night music!” The concert’s theme showcases songs linked to dreams, the moon, and the evening. Enjoy songs such as “It’s a Grand Night for Singing” from State Fair, “Tonight” from West Side Story, “I Could Have Danced All Night” from My Fair Lady, Stephen Foster’s “Beautiful Dreamer,” Cole Porter’s “In the Still of the Night,” Hoagy Carmichael’s “In the Cool, Cool, Cool of the Evening” and “The Nearness of You”, “Dream a Little Dream of Me,” plus many more! The Chorale is pleased to feature guest soloist Dimitri German. 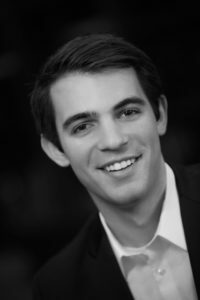 German is a Chicago-based baritone with a bachelor of music in vocal performance from the Moody Bible Institute and a graduate degree from Northwestern University’s Bienen School of Music. While at Northwestern, Dimitri performed the roles Figaro in Le Nozze di Figaro, George Benton in Dead Man Walking, Sir Despard in Ruddigore, and Tom in The Face on the Barroom Floor. A member of the Grammy Award-winning ensemble, The Crossing, he was recently featured as a soloist on their 2016 Grammy-nominated recording, Bonhoeffer. More recently, Dimitri appeared as the titular character in Petite Opera’s Fall 2018 production of Don Giovanni. A frequent concert artist, Dimitri’s recent solo performances include the role of Caliban in George Benjamin’s Sometime Voices (Northwestern Symphony Orchestra), Britten’s Cantata Misericordium (Valparaiso University), Haydn’s Creation (Musica Lumina Orchestra), and Bach’s Coffee Cantata (CHAI Collaborative Ensemble). Each concert will include our outstanding Youth Chorus and guests, Chicago-based professional jazz saxophonist Dan Burke and Stan Butler, President and CEO of Heights Finance, who will serve as the Master of Ceremonies. Friday’s concert will feature a special 60 voice children’s Festival Chorus comprised of students from area schools and will conclude with a dessert reception. Make springtime plans to join the Peoria Area Civic Chorale on Friday, May 3rd or Saturday, May 4th at 7:30 p.m. at Five Points Washington for a night of America’s favorite songs! For more information, call 309-693-6725 or email pacchorale@gmail.com.